Look for antiques, home goods, and more during the three-day happening. Look for antiques, home goods, and more at the Fallbrook flowers-and-more destination from Friday, Jan. 19 through Sunday, Jan. 21. SPRING CLEANING? It has a way of, you know, starting in the springtime, as its name so wonderfully suggests. But sometimes you can't wait on late March, and sometimes the time is right for letting a wave of fresh air, and roominess, into a basement, or a storage unit, or even... a barn. 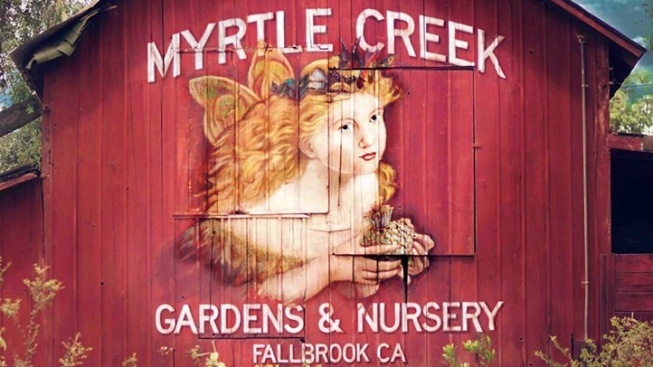 Which is what's happening at Myrtle Creek Botanical Gardens & Nursery in Fallbrook over the third weekend in January. And we mean really over it, since the event is lasting for three days, from Friday, Jan. 19 through Sunday, Jan. 21. The cleaning out of the barn means big things for those people who adore antiquing, and looking around at a host of vintage goods, and shopping for home decor, and searching out the most quaint and charming items to display in their yards. Those items will pour forth from the Myrtle Creek barn through Jan. 21, so if your antique-searching senses are aflutter, and you feel in your bones that a bargain or an unusual and perfect chair for your deck will be found, best find your way to Fallbrook pronto. THERE ARE EATS, TOO, FOR PURCHASE, including "(e)gg sandwiches" (mmm, think brioche roll) and salads, too. Which means that making a day out of it, with a light and fortifying lunch before and/or after you peruse those "reclaimed" and "repurposed" antiques from the barn, is a most excellent way to go. Keep in mind, of course, that spring is on fluttery, flowery approach, so take some inspiration from the plants you see around the property. Cost to enter? Free. Cost to park? That's as free as a spring breeze, too. Happy still-winter cleaning to Myrtle Creek, and happy lookie-loo-ing to those people seeking to up the charm around their own garden or house.